I recently returned from a short trip to New Orleans, and I’ll be the first to tell you that I really enjoy traveling. Breaking up the daily routine, taking in new sights, meeting new people, and eating exotic foods are all check marks that keep me eager to explore the world. However, the inevitable downside of traveling (especially if you’re destination is overseas or cross-country) is jet lag. Even traveling across two or three time zones is enough to throw your body off, and nothing puts a damper on your day like a bad night’s sleep—especially if your body is confused about when it’s supposed to sleep in the first place. Fortunately, there are a number of tips and tricks that can help you avoid the effects of jet lag and make the most of your vacation. 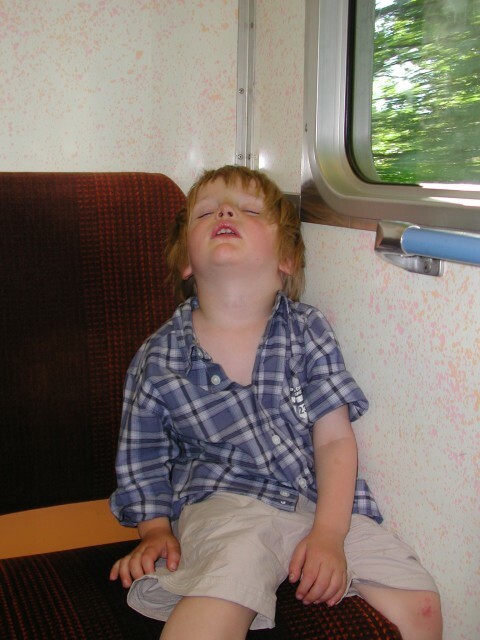 Jet lag is a relatively new phenomenon brought on by the advent of commercial air travel. In the medical community jet lag is known as desynchronosis, which is a physiological condition resulting from rapid travel across multiple time zones. Jet lag isn’t caused by the act of flying on a jet; rather, it is purely due to your body trying to adjust to a different sunrise/sunset schedule than you’re used to at home. Jet lag affects people differently, and the amount of time your body needs to readjust depends on a number of factors. The general rule, however, is that you should allow one day per time zone crossed to let your body adjust to its new schedule. If you’re traveling from New York to Los Angeles, for example, which has you cross 4 time zones, you often don’t have 4 days to get back in the swing of things. Fortunately, there are some steps you can take to minimize the effect of jet lag. While none of these recommendations are a surefire way to avoid jet lag, they are certainly worth a try­­­—especially if it means feeling rested and ready to make the most out of your travel adventure. Drink plenty of water. When traveling on a plane, you are more susceptible to dehydration, which can result in a general feeling of fatigue. This one is pretty easy to avoid, and you should be drinking lots of water regardless of your travel schedule to improve your overall health. Drinking alcohol on a plane makes you more susceptible to dehydration, so save your Mai Tai’s for the beach. Exercise before your flight. Regular exercise can help you sleep better in general, and is even more important for long-haul flights. Since you’re stuck on the plane anyway, you might as well try to recharge your batteries before arriving at your destination. While sleeping on a plane will never make up for a good night’s rest in your own bed, neck pillows and blankets can help make you more comfortable on the plane. Fight your usual routine (don’t sleep during the day). If you land at night, then you should go to sleep and wake up as usual. However, if you land during the day it’s important to fight the urge to go to sleep and power through until a normal bedtime (for that area). This will help force your body to get used to its new schedule. Coffee (caffeine) can be helpful for powering through the first day, but don’t go overboard with it. 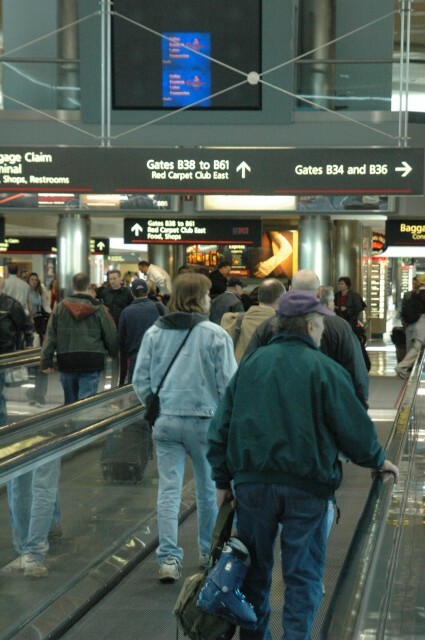 You can also try adjusting your schedule to your destination time before your flight. Shifting your sleep schedule at home by a couple hours can help get you used to a different time zone before you depart. For the ultimate regime, there are several apps available for download on your phone that will offer some steps you can take to combat the effects of jet lag. Many of these apps simply require you to set your home, your destination, your usual wakeup/bedtimes, and the length of your visit. Using this information, these apps will offer a number of recommendations, such as a pre-flight sleep schedule, that can help you offset the effects of jet lag. Do you have any tips for avoiding jet lag? Let us know in the comments below. 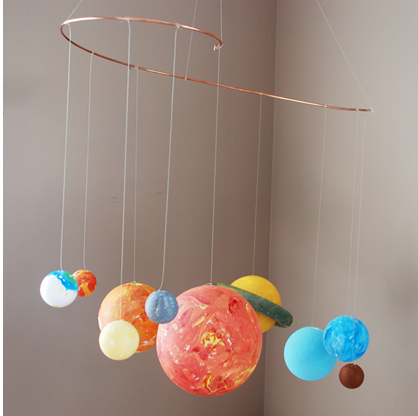 Lately, I’ve been looking at solar system mobiles. Here are some of my favorites. This one was created by Alanna George @ the Craft Nest from the Creatology Solar System Kit from Michaels. I love the fact that they painted the pieces themselves. It is one of those pieces I could see a kid holding onto long after they’ve outgrown the interest because it’s his/her work of art. 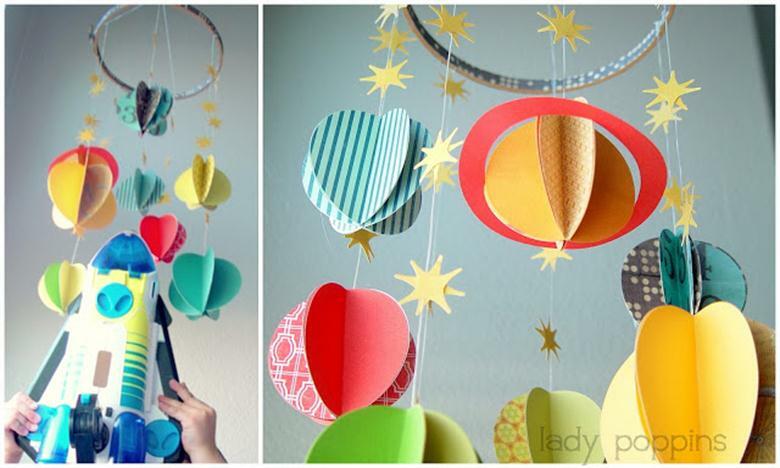 Here’s another do it yourself solar system by lady poppins. I like the stylized representation with the mixture of patterns bringing a lot interest to this piece. 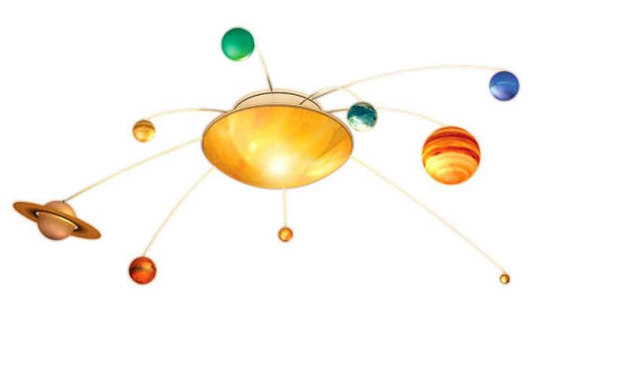 Less personal, but more realistic for a non-crafty mom like myself is this motorized solar system that rotates the planets around a sun that you install as an overhead light color. It also comes with a 15-minute audio tour of the solar system. 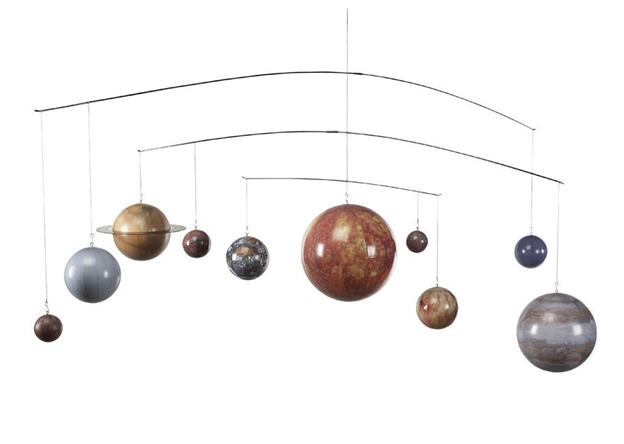 Finally, for those who want scientific precision in their solar system mobile, this one from Edmund Scientifics has planets that follow their actual orbit paths as they spin independently of one another. Don’t forget that the Lyrid Meteor Shower peaks the night on April 22, 2013. Get outside and watch Nature’s own mobile show. Keith is an only child on a road trip with his parents. His prized belonging, which he has carried with him all over the place, is his collection of toy cars and, especially, his toy motorcycle. Ralph is a young mouse living in a knothole at a hotel with his family. When Keith moves in to Ralph’s room, Ralph cannot help but admire the shiny chrome motorcycle which is just the right size for a mouse. Unfortunately, during a surreptitious test drive, Ralph gets startled and tumbles, cycle and all, into the garbage can. When the boy discovers Ralph, he is sure that’s the end of him but what do you know? Keith is actually super nice! He even shows Ralph how to make the motorcycle drive! Thus begins the friendship and adventures in Beverly Cleary’s classic story. 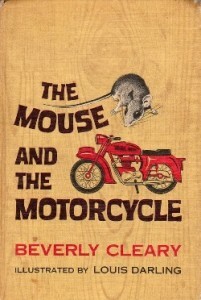 I began reading this to my son a week ago, partly because he will be attending the Beverly Cleary elementary school next year. It’s a great book to read out loud to kids: nice short chapters and nothing too complex going on. I love coming to the end of a chapter and hearing: “Can we read just one more chapter, please? ?” Music to a librarian’s/father’s ears. As many seasonal allergy sufferers already know, spring is well underway. While I welcome the warm sunshine and longer days, I’ve had my fair share of allergies to contend with (and expect a few more bouts before summer is here). To help you make it through this year’s wave of pollen, I’ve put together four tips to help you transform your bedroom into an allergy-free haven. 1. If you like flowers, get a printed comforter cover. Flowers are a wonderful way to show your friends and love ones that you’re thinking about them; however, they can be a real bother on your allergies. If you have a bouquet of fresh flowers, keep them where everyone can enjoy them (not your bedroom). You should also avoid certain types of flowers such as daisies and sunflowers, as these are two of the worst types of flowers for allergy sufferers. 2. Keep up with your pets’ hygiene, and keep them out of the bedroom. 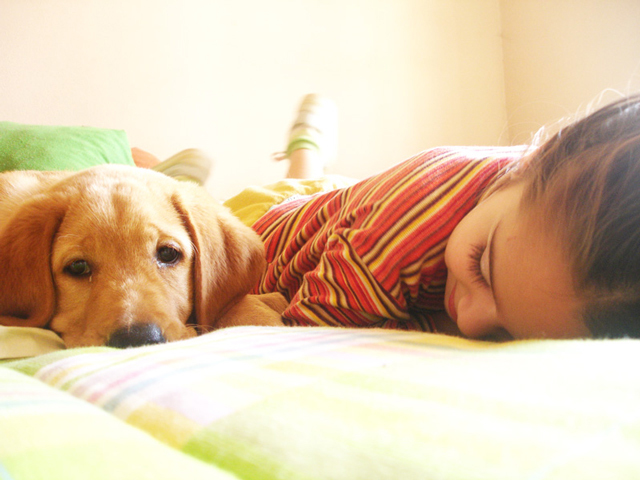 If you keep a pet in your home and are allergic to him/her, then you absolutely must keep your pet out of the bedroom. Bedding has an uncanny way of trapping allergens that can be especially difficult to get rid of once they’re lodged in there. To help cut down on allergens throughout the house, you should also give your pet a bath regularly, wash its bedding, and consider using a HEPA filter on your vacuum to be sure you’re trapping as much of your pet’s allergens as possible during regular household cleaning. 3. Give your mattress a deep clean. While you probably wash your sheets regularly, when is the last time you cleaned your mattress? Mattresses collect more dust, dirt and debris than you’d care to think about, and a dirty mattress can aggravate your allergies or cause other respiratory problems. A quick and easy way you can clean your mattress is by sprinkling baking powder (which helps trap moisture and smells) over the top and then sucking it back up with a vacuum cleaner attachment. In addition to cleaning your mattress, you should also flip it or rotate it regularly to ensure even wear (and give yourself another reason to clean it). For dirtier mattresses, you can use a handheld steamer. Finally, don’t forget to clean under the bed—it’s one of the dust bunnies’ favorite places to hide. 4. Invest in an air purifier. I’m a big advocate of air purifiers, and for good reason: they are an effective way to circulate clean air throughout your home. They trap allergens, dust, and can even kill viruses and bacteria. I wrote an article a couple months back explaining the differences between the types of air purifiers for the bedroom. Just a quick reminder: an easy way to compare air purifiers is by their CADR rating, and cost of replacement filters. By reducing allergens in the bedroom, you can create a much more enjoyable environment for your body to restore itself every night. 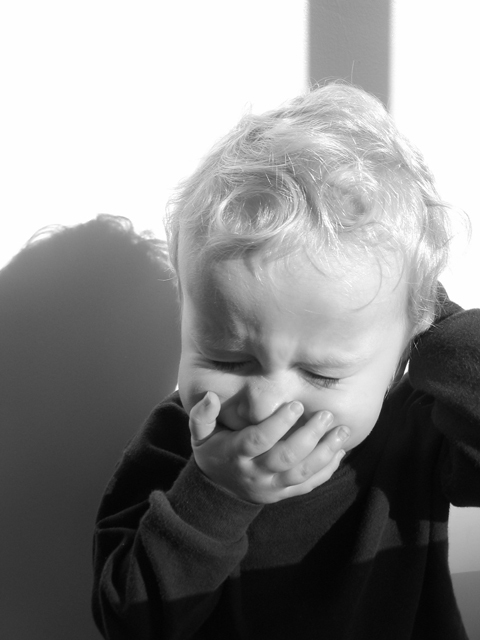 Do you have any tips for allergy sufferers this season? Let us know in the comments below. My greatest inheritance from my maternal grandmother Emily is a pile of frayed newspaper clippings, notebooks, and handwritten, yellowed recipes. I take them out occasionally for inspiration, or for a good chuckle over popular recipes from the 1940s. But sometimes I find them frustrating – Grandma, is this page permanently marked for Glazed Baked Apples or Peach Cobbler? Who were you writing to in your handwritten Starlight Double-Delight Cake recipe when you wrote “Good luck, Little Mother”? Or were YOU the Little Mother? Well, this time I hit paydirt when leafing through Heckers’ Household Hints. In addition to loads of great tips (e.g. – to take the place of a paper clip, go to the sewing cabinet for a dress-snap), I found many inspiring recipe ideas. 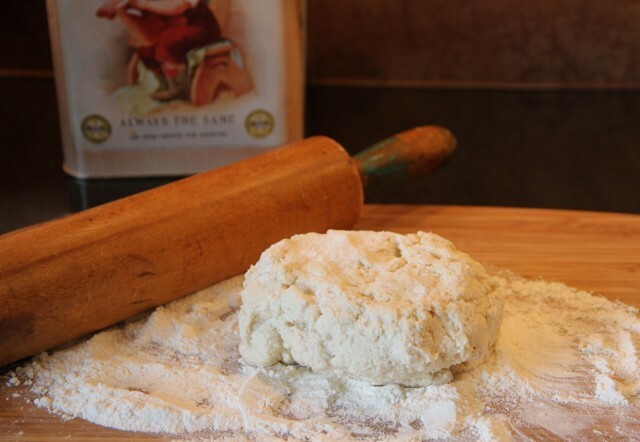 Heckers’ suggests making a “Home Prepared Flour” to store in the fridge. Then, when time avails, use it to create a variety of yummy choices such as Pineapple Pom-Poms, Orange Fluff Cake, or Aunt Hattie’s Sugar Cookies. It was the Cheese Bacon Shortcake, though, that won me over. Modified, modernized and renamed for my fellow blogger friend, Bacon Biscuit (take a look at her great blog, coolcookstyle.com, I’m pretty sure the layers of crumbly, cheesy, buttery bacon-topped biscuit will grab you too. Thanks Grandma, for an inspirational breakfast in bed. Preheat oven to 450°. Lightly grease pie pan and set aside. Combine flour, baking powder, and salt in large bowl. Cut butter into small pieces and mix with flour, using a pastry cutter if you like, until mixture resembles coarse sand. Stir vinegar into milk. Pour all at once into flour mixture, and stir until just mixed. 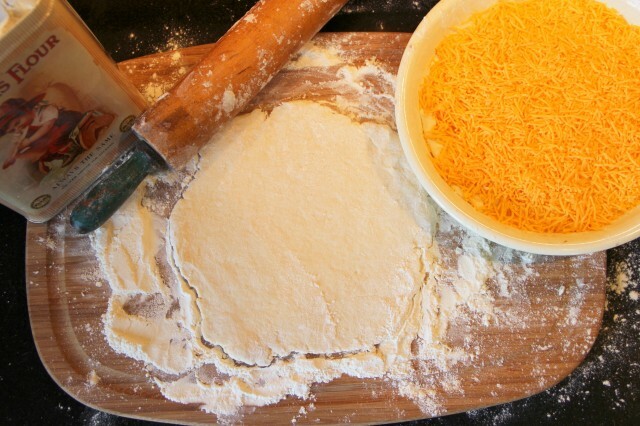 Roll out and press a little more than half the dough into a pie dish. Brush with melted butter and cover evenly with cheese. Pat or roll out the remaining dough into a circle slightly large enough to cover the bottom layer. Place on top of cheese. 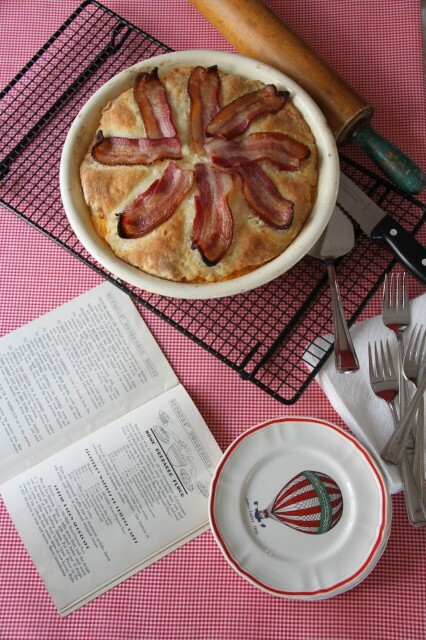 Place bacon strips on top, radiating out from the center in a star-like pattern. 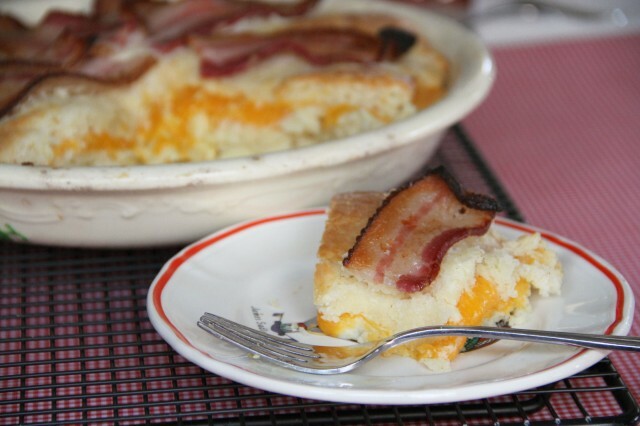 Bake at 450° until bacon is crisp and brown, about 20 to 25 minutes. Serve immediately. Makes one pie, about 8 servings.